A couple months back we checked out Waveby dark electronic outfit Ventenner and we rather liked it’s abrasive take on all things hip shaking. Last week the band released their much anticipated new album Distorture and well, here’s hoping it too satisfies our like for dancing around in dirt. Lead single Six Blood is everything dark, electronic and distorted which means the album has already succeeded in achieving it’s goals in a matter of two songs. Opening segment Rise was a little taste of what’s to come as it filled the room with noise before producing one riff at the end. Six Blood delivers the goods with a whole load of distortion, rhythms and big rock sections and synths to top it all off with a demented cherry on top. It’s great. Unaffected takes Distorture on a route down the mental asylum as it’s blood-curdling vocal hook on the chorus does a good job at making us wince a little. It’s also a great example of how good Ventenner are at luring the listener into their material believing one track’s going to be a pretty accessible listen, as it’s guitar riffs generally sound catchy for the most part. But then the band pack it with ear-bleeding screams, huge crashing drums and terrifyingly heavy distortion to not only throw all ideas of accessibility aside but also continue maintaining Distorture‘s off-kilter sound. Metacell is argubly the catchiest track on the album with it’s chugging drum beat and palm muted guitar creating an intro that builds and builds intensity effortlessly, making it almost uneasy to sit through it. Ventenner pack all kinds of energy into their instrumentation and vocals to make this one of the highlights of the record, and almost makes us quake at the knees in fear. If it wasn’t so catchy in some moments we would be running scared. Towards the end of the album is Cast, another personal highlight for us. 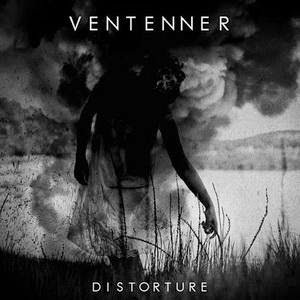 Ventenner take a step back on the hard hitting distortion and instead focus on making a track that’s layered with varying forms of guitars, backing vocals and harmonies to create a nice break amongst the intensity while also sounding more than just a short interlude. Guitar melodies mix in against the dual vocals which allows Ventenner to showcase their darker side without necessarily sticking to volume, and it makes for a pretty interesting listen. Distorture is a good album that reveals a lot about the sound of Ventenner while also showcasing the band’s ability to take it down different paths to produce material with various levels of intensity. The band do a good job at making everything consistent and while the album could have benefitted from a little more variety they do ensure that Distortureis entertaining at least. For more music reviews, free downloads and my ears hurt check out Exploding Head Syndrome on Facebook and Twitter.